The Rockport Film Review: "Stigmata" Yeah its Really is That Bad! Usually, I don't do reviews of bad movies but when I originally saw "Stigmata" on DVD in the late 90s I actually thought it was pretty good. Now as I re-watch it over 10 years later I can definitely say, What the hell was I thinking? It feels dated, overly stylized and just plain bad all around. Taking place in the waterlogged city of Pittsburg, where it is constantly raining and dreary. 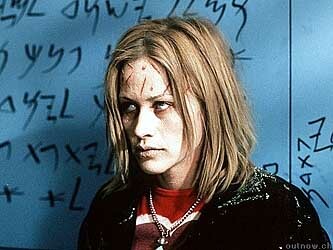 Patricia Arquette plays Frankie Paige a hair stylist who becomes afflicted with the stigmata, or the wounds of Christ, after receiving a rosary from her mother as a gift. The rosary belonged to a recently deceased South American priest whose church recently had their statue of the Virgin Mary bleed. Frankie is an atheist and the stigmata usually only appear to extremely devout Catholics. The wounds of the stigmata cannot be transferred through physical items. Its also has nothing to with demonic possession, actually quite the opposite. We then meet Father Andrew Kiernan, a Vatican investigator of miracles. He is sent to meet with Frankie and we learn that she is 23 years old, yeah sure you are and I am Abraham Lincoln. They talk and she tries to seduce him, and he refuses for the most part. Later on, she seems to be possessed by some evil spirit and writes all over her apartment walls. This is supposedly is a lost gospel of the Bible written by Jesus himself. It tries to be scary and horrific but epically fails. This train wreck was directed by Rufus Wainwright and like a lot of movies in the 90s, it suffers from over stylization (AKA The Tarantino Effect). Style over substance and style just for the sake of trying to be "cool". It pays no attention to factual accuracy and just kind of creates its own thing on the fly. The musical score sounds like something out of the 80s and not in a good nostalgic way. The entire look and feel of the film is pretty dated and it wasn't even made that long ago. This is definitely a view at your own risk movie.